Infants as young as five months can differentiate laughter between friends and that between strangers, finds a new study by researchers at New York University and UCLA. The results suggest that the ability to detect the nature of social relationships is instilled early in human infancy, possibly the result of a detection system that uses vocal cues. It's been recently established that colaughter—or simultaneous laughter between two or more individuals—allows adult listeners across different cultures and languages to quickly evaluate the nature of relationships between people: are they friends, acquaintances, or strangers? To do so, they examined how five-month-olds processed exchanges of colaughter of adults—specifically, those who were strangers and those who were friends—by gauging how long they listened to these sounds (Note: Developmental researchers have historically established that infants' preferences are evident through longer listening or looking times). 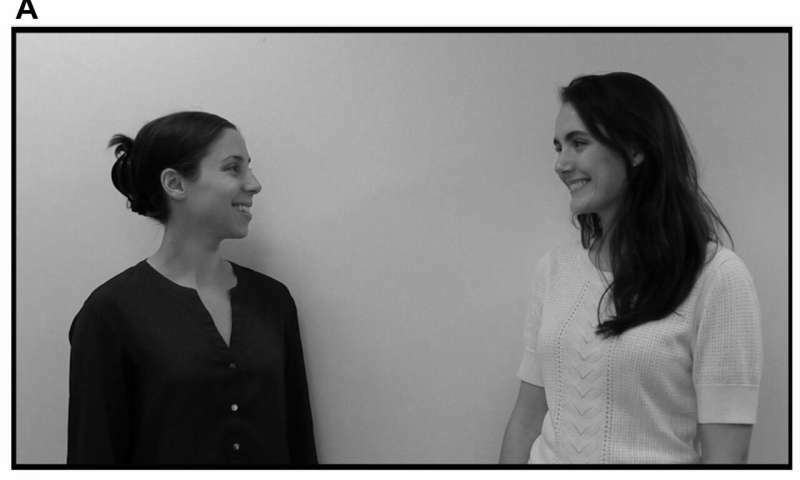 Gaze length is also a commonly used measurement for spotting infants' comprehension of interactions, with a longer gaze evidence of surprise—or, in this case, a mismatch between colaughter and the nature of the relationship.